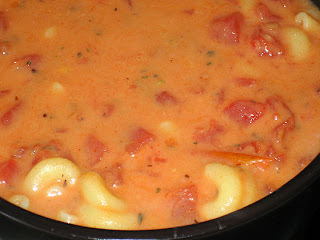 I'm continuing my "lazy cooking" theme this week by jazzing up one of my favorite foods: cream of tomato soup. This particular dish is so easy yet it impressed an omnivore, too! My sister currently lives upstairs from me (we live in a multifamily home) and I joined her for dinner because her hubby wasn't going to be home till later that evening. She had prepared a chicken breast and side of veggies for herself. When I appeared with my bowl of yummy soup, she said "Wow, that looks gooooood. Can I taste it?" She said my soup looked more appetizing than her meal. :) Score another one for the veg*ns! By looking at it, I would never guess the base of this soup was condensed tomato soup. Kudos to you, it looks good!